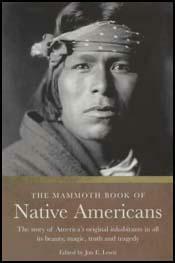 Mangas Coloradas, a member of the Apache tribe, was born in New Mexico in about 1795. A superb warrior, he eventually became the chief of the Eastern Chiricahuas and led constant attacks on Mexican settlements in Sonora and Chihuahua. In October 1846 Mangas Coloradas he began negotiations with Brigadier General Stephen Kearny in an attempt to form an alliance against the Mexicans. These discussions ended in failure and in 1852 Mangas Coloradas signed a peace treaty bringing an end to his raids on Mexico. 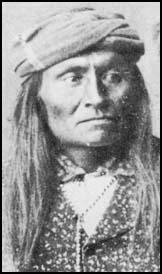 During the American Civil War Mangas Coloradas joined forces with Cochise to attack white settlers. Mangas Coloradas and Cochise killed five people during an attack on a stage at Stein's Peak, New Mexico. They also joined up with Victorio and Geronimo at the battle of Apache Pass. Soon afterwards he was badly wounded in another raid. Mangas Coloradas was taken to Janos where a Mexican doctor was forced to treat him. Apparently the doctor was warned that he would be killed if Mangas Coloradas did not recover. Mangas Coloradas was eventually captured by a party of soldiers and taken to Fort McLane, New Mexico. He was murdered by his guard on 18th January, 1863.